Located in the heart of Hanoi’s Old Quarter, our Downtown Hostel is known for its legendary bar, nightly big parties, it is a constant hive of activity. It is close to delicious street food and pumping bars. 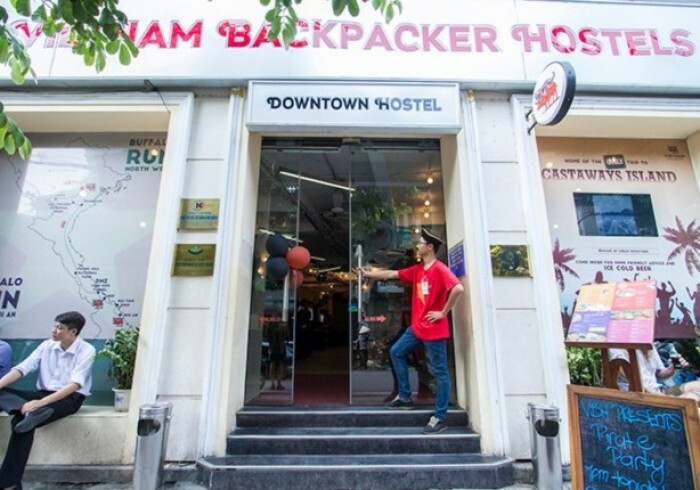 However, If you’re after more of a chilled out, homely hostel then check out our sister hostel Vietnam Backpackers - The Original! It’s a short walk away from Downtown, just by St Joseph’s Cathedral. Downtown offers both dorm and private rooms, all of which are air-conditioned during the night to ensure you have a comfortable nights sleep. Breakfast is included and we also have placed hydration stations (free drinking water) around the hostel, especially important after a big night out!! Our restaurant and bar serves up tasty comfort food, local Vietnamese food specialities and DAILY happy hours! We have awesome events including quiz nights, beer pong, themed dress-up nights and much much more… Good times are our business! We also offer: - FREE BEER 5pm-6pm -	FREE WIFI -	FREE computers for guest use -	FREE walking tours through the Old Quarter -	24 Hour Reception -	Airport Pick Ups -	Visa Invitation Letters -	Chill-out floor with a pool table, foosball and comfy sofas and bean bags -	Large TVs by the bar so you don’t miss out on your favourite sports -	Outdoor roof terrace with a great streetscape view. We have awesome travel desk staff who are ready to help with all your travel needs. Feel free to speak to them about anything from local daily recommendations to full country itinerary planning including a visit to our hostels in Hue, and Hoi An; an escape to paradise at our amazing backpacker resort, Ninhvana; a stop at our newest urban hostel in Sai Gon with rooftop views to last a lifetime; a rural countryside adventure in the North AND of course, we can’t forget to mention that we are the home of the original Castaways Island trip in Ha Long Bay! We look forward to seeing you soon!